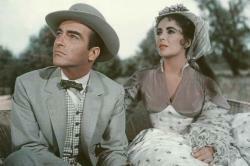 Montgomery Clift and Elizabeth Taylor in Raintree County. Epic movies were big business in the glamorous nineteen-fifties. Joining Technicolor and widescreen to compete with that upstart known as television was the concept of really long movies. Sure the idea wasn't new, but it became much more commonplace. 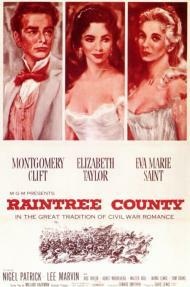 Elizabeth Taylor was the undisputed queen of this type of movie, having already starred in Giant and with Cleopatra looming over the horizon, when she appeared with Montgomery Clift and Eva Marie Saint in Raintree County. The title refers to a mythical tree from China supposedly planted in the swamps of Raintree County, Indiana by Johnny Appleseed. The finder of this tree will be endowed with the secret of life itself. Based on the novel by Ross Lockridge Jr. Raintree County tells the story of John Wickliff Shawnessy (Clift) a young idealistic student who dreams of becoming an important writer like his idol Byron. He is shown as a sensitive but all around regular guy. He is a favorite student of the freespirited and hyperbolic Prof. Stiles (Patrick) (who later gets into trouble with a local farmer's wife), wins a foot race against the braggadocious Orville 'Flash' Perkins (Marvin) and courts his sweetheart, the earnest but rather plain Nell Gaither (Saint). 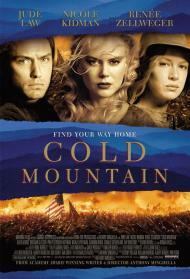 Then, like a hurricane, in blows southern belle Susanna Drake (Taylor) changing his life forever. The long first act deals with their marriage and the birth of their son, and hints at a dark family secret in Susanna's past. Here, at times, the pacing drags a bit but fortunately it recovers in the much shorter second act. Here John goes to war as a Union soldier. He is reunited with Prof. Stiles and Flash Perkins and experiences the Hell of war. Lee Marvin has a great death scene as Flash. He has been shot by rebel soldiers who are waiting in the bushes for him to die. With his last bit of strength he yells out defiantly, 'I come from Raintree County!'. It is an emotionally powerful moment. The acting is all around superb. Nigel Patrick is great as the cynical/dreamer professor. A part that Kevin Kline would be perfect in if they ever do a remake. Elizabeth Taylor chews much scenery while looking as voluptuous as ever. Like Bette Davis she had the ability to make any line of dialogue sound better than it was written. But this movie belongs heart and soul to Montgomery Clift. He is simply brilliant. Brando had more fire and Dean more attitude but Clift was the finest actor of their generation. Early in the movie there is a scene where John gets drunk for the first time. I find it humorous to watch the notoriously hard drinking Clift act like he is downing his first ever taste of liquor. It was probably the biggest acting challenge of the role. While not on the same monumental level as Gone With the Wind or Giant, Raintree County is solid, old-fashioned, motion-picture entertainment with an evocative setting and one hell of a cast.